One of the things I love most about food is the ability to connect. Connecting to people or in the case of this cauliflower pizza, a place. Shortly after moving from my hometown, a pizza place started up that is delicious and inventive in their pizza toppings. I posted this pizza a couple years ago but after eating the restaurant’s version recently, I’ve changed up the recipe to closer resemble that pizza. This recipe connects me back to my hometown and with it, my family. Plus, it’s just a really good, funky pizza. Preheat oven to 400˚ F and place pizza stone in oven if using. Cut cauliflower florets into small, bite-sized pieces. in a roasting pan or sheet tray covered with parchment paper, toss cauliflower with 1 tablespoon olive oil and at least 1 tablespoon curry powder, enough to coat. Bake until browning, 20 to 25 minutes. Turn up heat to 500˚. Roll the dough out onto a surface covered in cornmeal (I used a large wood cutting board put some of you may have a pizza peel.) Roll/shape the dough out to about 14″ circe. 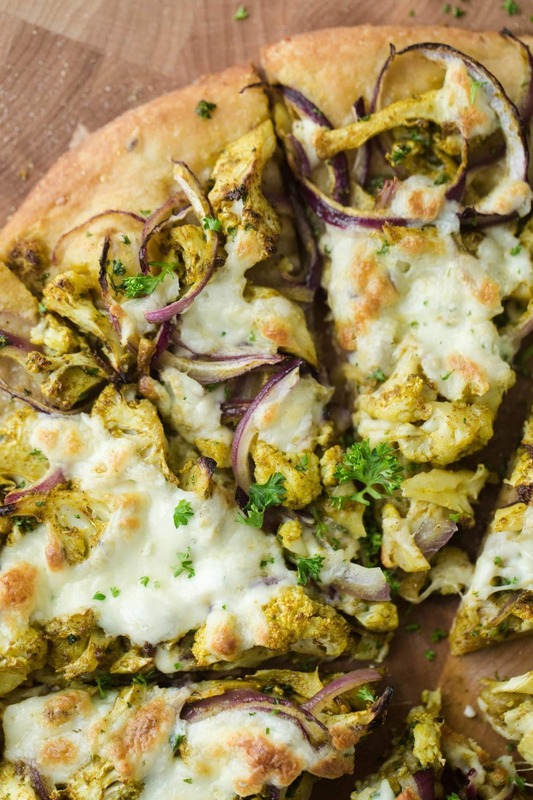 Combine roasted cauliflower with red onion and parsley. Brush 1 tablespoon of oil over rolled out crust and spread cauliflower over crust.. Sprinkle cheese on top and slide pizza into the oven. Bake until crust is golden, 10-15 minutes depending on oven. This recipe was inspired by a similar pizza I had at my favorite local pizza shop in Galesburg, IL (Baked). The flavors can change greatly depending on the curry mix you use. I highly recommend experimenting! In place of the parsley, I like cilantro. I think this pizza is all about the curry powder. You can of course make your own but I actually like to pick up a few different varieties and play around. This particular version I photographed was with an African Curry from this spice company (it was just enough spice). I also like this spice shop. Greens: I’ll occasionally add a bit of spinach to this pizza for extra color. Cauliflower: Sweet potatoes are another good option for roasting with curry powder then throwing on a pizza. Cheese: I usually stick with fresh mozzarella because the flavor of the curry is predominant however, any good melting pizza cheese works. Recipe originally published on May 15th, 2013, last updated on December 19th, 2015. I certainly do believe that this is delicious- those photos have convinced me! LOVE! Curried cauliflower is on of my favorites! Oh. My. Goodness. I need this pizza in my life, STAT. Looks delicious, I will have to try this, but without the pizza. I sadly don’t own a oven. You seriously had me at curry. I could eat curry every day and be happy. That, on pizza, makes this perfection! WIll have to try this one soon. What?! OMG yes! This reminds me of Zante’s Indian Pizza, which is legendary here in San Francisco, only it looks much better and healthier. The whole wheat crust is gorgeous, and so is the color of the curry. You’re a genius! Pizza weekend. *Does the pizza dance*. This looks great, such a great mix up from the usual. Thanks for sharing! What is pastry flour exactly? I have whole wheat flour. Same thing?? Pastry flour is ground from a different wheat berry that makes the flour a bit lighter. 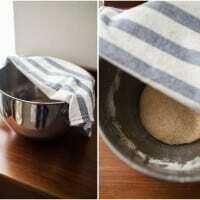 Regular wheat flour works for this recipe as well! Made this last night. Loved it! This looks so fabulous Erin! Love this unique idea! Have to try this pizza! 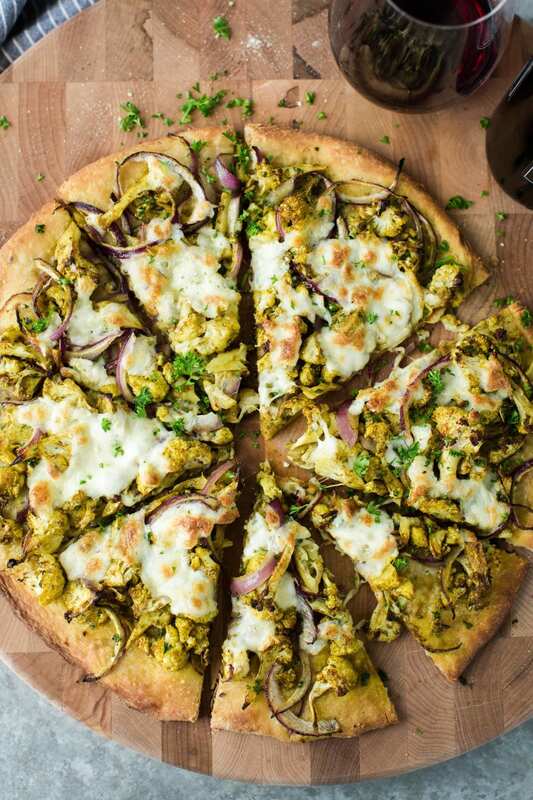 Love cauliflower, love curry, love love pizza! Yum! Looks and sounds simply divine. I have quite the obsession with cauliflower. So much to love about this wholesome pizza. And it also happens to be a beauty!! Pinning! Any chance you could repost your original recipe somewhere? While this version looks yummy too, I had your old version bookmarked for months and we all love it so much! I think I have it memorized, but I’d be nice to see it one more time so I could save it off permanently. We love your website and use your recipes almost weekly. Thanks for the awesome recipes and ideas!! AMAZING!!! I’m definitely trying this!!! !